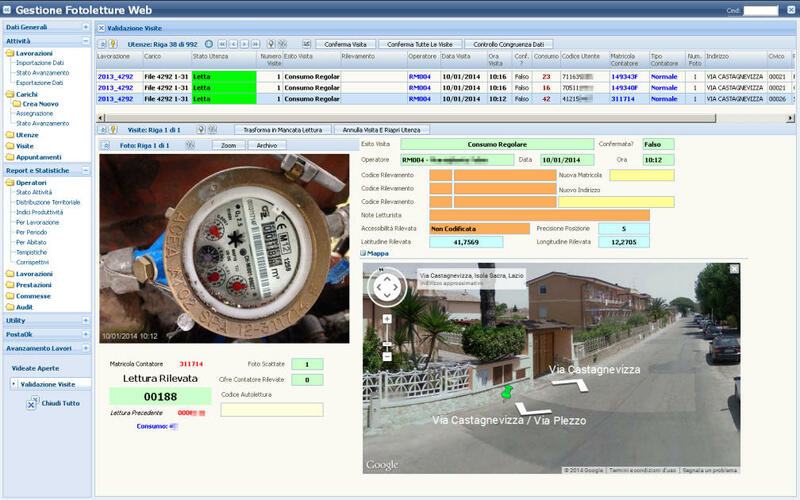 GETWeb is the software platform developed by F.IMM for the complete management of all back-office support of meter photo-reading, census and measurers replacement. Built on web technology, Web 2.0 manages the information flux in a simple and efficient way, broadcasting in REAL TIME with acquisition gears on site equipped with App GETWebMobile. GETWeb is multi-consumer, multi-commission and multi-service. No installation is needed, just a browser web. It is integrated with mapmakers such GoogleMaps, not merely by map visualization, but making it possible to interact actively with it. 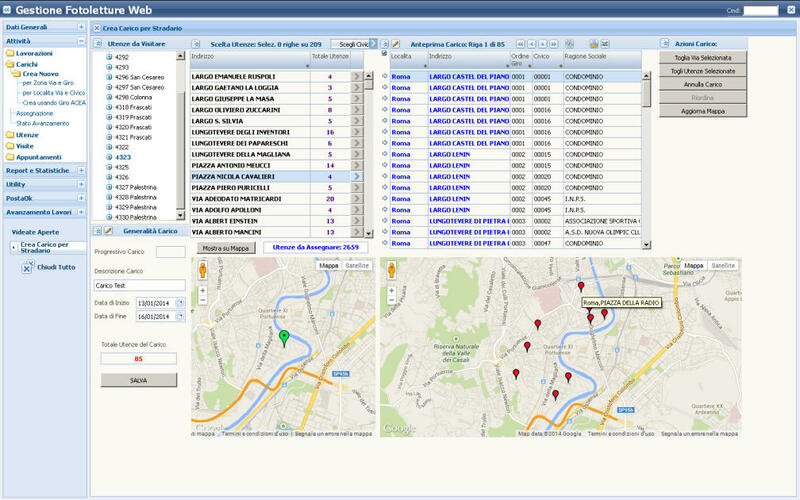 The visualization of data used as graphics and reports, allows the operator to keep all the work advancement under control immediately. 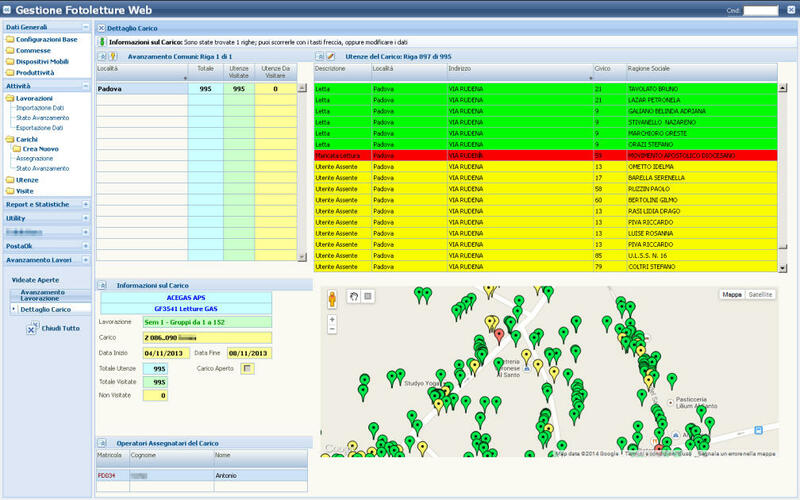 It allows the export of every single datum, statistic and report toward the most used office automation. GETWeb is able to import data from the most diffused Utility administrators in any type of format (file, ASCII, CSV, XLS…), simply by carrying out automatically, check-ups of consistency and suitability of data during the import of work loads and the export of collected data and photos. Organizing the work of operators, redistributing on a logical and geographical way, the utilities to be visited by. 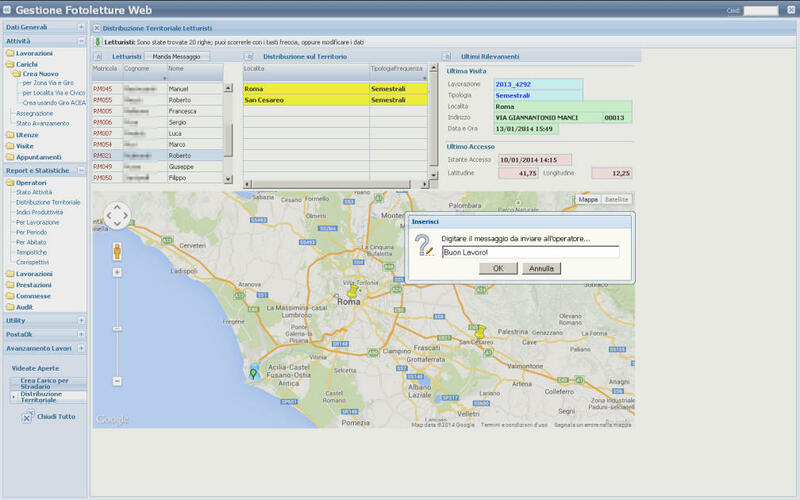 Using the maps of Google Maps at an interactive system, the distribution and the reading route previously existing, sharing the work load among the operators is simple and fast. The work load organization is collected and saved in GETWeb database, so to be reused in the following reading campaigns. Transmitting utility data and receive photos and readings from mobile implements on site in REAL TIME. The use of mobile high speed connections on Smartphones, allows the operators to receive and broadcast data and photos to GETWeb at any time. IThe job coordinator is constantly updated on the progress of the work on site, in order to constantly balance the work load of each operator, so to reach the aims of performance required by the buyers. The powerful verifying instruments of the operations carried out on site, make it possible to quickly detect and rectify the collected data acquired before their redelivery to the buyer. Visualizing both the photos of the meter and environment, the effective and estimated use detected, the geographical position of the read meter and various annotations gathered on site by readers, the verifying operators can benefit of all information to validate all work carried out and avoid fines. GETWeb makes it possible to check on the operators as well as the fleet on site, visualizing their latest position and the work progress of the job they have been given daily. From GETWeb It is possible to send messages and notices to individual readers or to force the performance of some activities on their Smartphone. Easy to read statistic graphic panels permit the checking of work progress of operations and loading in real time.